Angry Birds have become something of a phenomenon similar to the LEGO games. Angry Birds is even following LEGO to Hollywood, getting their own cartoon movie treatment. Most Angry Birds games revolve around solving puzzles, but Angry Birds GO! 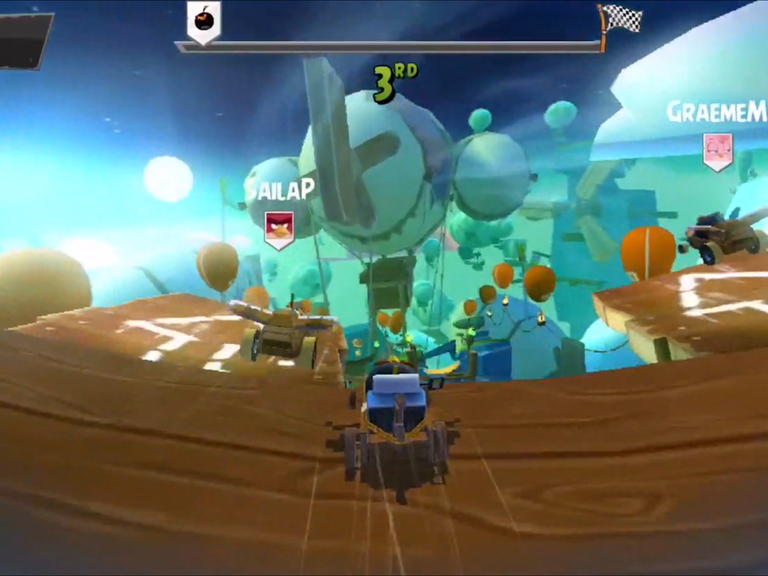 casts everyone's favorite birds in a kart-racing game, which not only includes championship racing against the piggies, but also some interesting mini-games like mowing down fruit for coins. These simple tips should help you get up and running pretty quick. Coins slow you down. Everyone likes some coins jangling in the pocket, but the best place to be on a turn is on the inside, so if you are in a tight race, ignore those coins on the outer rim. Don't forget about handling. It's easy to go straight for speed, but you'll lose that top end speed if you handling isn't up to par, which causes you to spin out more. Use your special power on straightaways. You'll start with a special power that gives you a speed boost, but you might not get the full effect if using it right before a turn. On the beginning track, try using it as you approach the finish line. You can increase CC with more than just speed. Any upgrade you buy will increase your CC a little bit, so don't think you always have to hit speed just to qualify for a new race or track. Don't slingshot too early. A basic tip, but worth noting. If you slingshot too early, you spin out, so learn to tie the 3-2-1-go. You can unlock characters with telepods. Combining real-world toys and digital world games is all the rage these days. You can unlock characters the easy way with telepods, which are available in most stores. And if you get the Angry Birds Jenga Toy Set, you can unlock the Jenga's Pirate Pig Attack minigame. Do the Daily Events. You can win more coins by making sure you do all of the daily events first. Sign into Facebook. The more coins you have, the faster you can upgrade your car, so if you have a Facebook account, sign into it to get double rewards. Buy the Coin Doubler. If you are really super addicted to the game, the Coin Doubler (around $6.99 as an in-app purchase) can be the best thing to buy in the game.